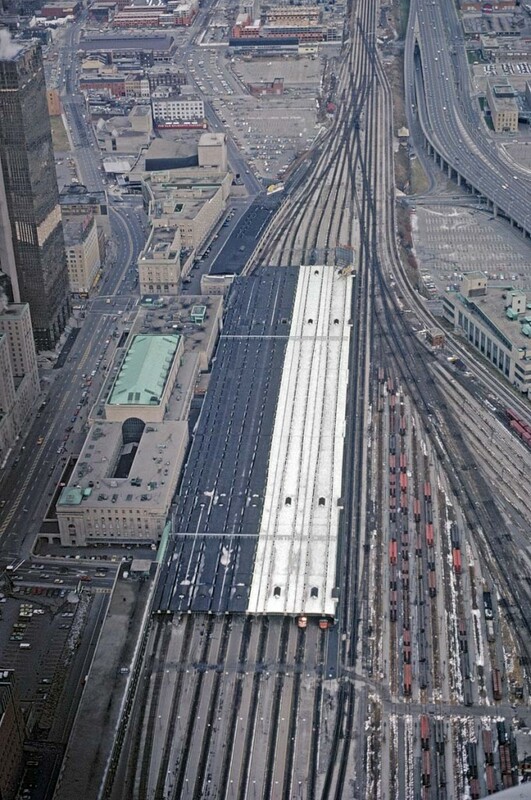 Railpictures.ca - Dave Beach Photo: Toronto Union Station as it looked from the CN Tower in December 1978. I need to make a trip to see just how shocking the difference is now. The nose of the westbound Canadian is poking out of the train shed on the 2nd track from the right. | Railpictures.ca – Canadian Railway Photography – photographie ferroviaire Canadienne. Caption: Toronto Union Station as it looked from the CN Tower in December 1978. I need to make a trip to see just how shocking the difference is now. The nose of the westbound Canadian is poking out of the train shed on the 2nd track from the right. Thanks for sharing this. I worked on Church street for a while and would have lunch on the back deck of the St Lawrence Market to watch the trains go by.